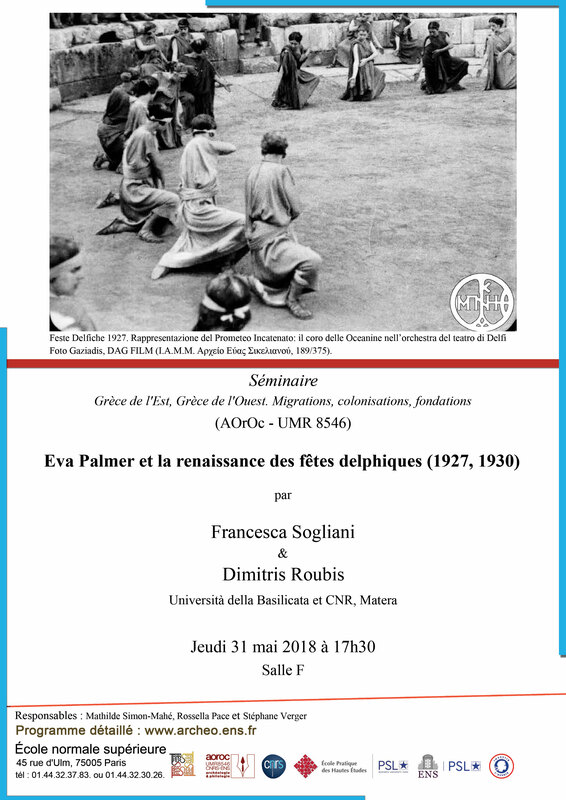 Jeudi 31 mai 2018 à 17h30, salle F (escalier D, 1er étage), École normale supérieure, 45, rue d’Ulm, 75005 Paris. The conference focuses on the figure of Eva Palmer (1874 - 1952) who, together with the Greek poet Angelos Sikelianòs, realized the “Delphic Feasts” in 1927 and in 1930 in the archaeological site of Delphi. It was an extraordinary event that had a great impact on the society of that time, it was divided into several cultural and athletic performances, including the first representation of Prometheus Bound of Aeschylus at the ancient theatre. This conference recounts the facts from Palmer’s point of view drawing inspiration from her autobiographical material and related publications. It also underlines the importance that the various film shots and photographs had in order to immortalize the Delphic Feasts. The text highlights Palmer’s position regarding the role of traditional Greek music in the composition of the melody of Prometheus. It furthermore points out the effort made by Eva Palmer in creating the choreography of the tragedy and the other performances by studying a number of ancient artifacts (mainly Attic black figure and red figure vases) stored in various archaeological museums.